Now, a new study seems to support Nielson-Gammon's assertion and also adds a new twist - demonstrating how weather can often represent a very complicated picture. 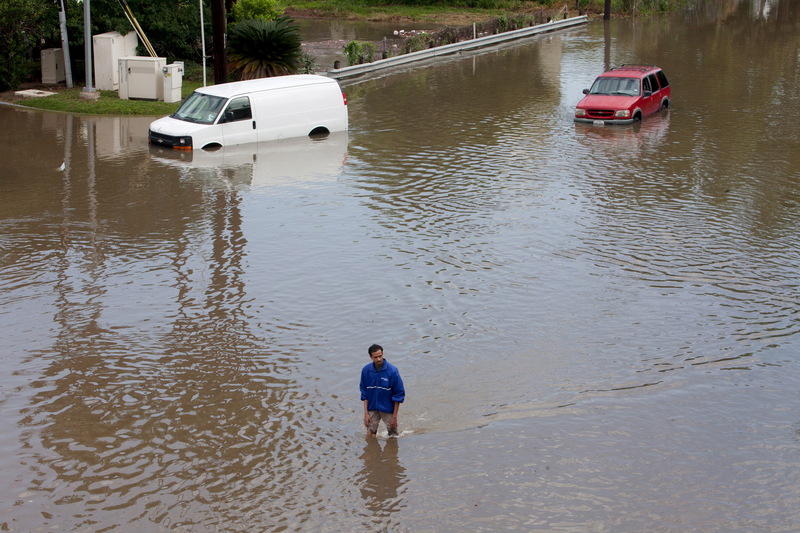 It found global warming along with El Nino likely played a role in worsening the floods. El Nino weather patterns occur when the equatorial waters of the Pacific Ocean warm significantly, causing increased rain in some parts of the world and drought in others. This year's El Nino is predicted to be among the strongest on record, with one national weather forecaster calling it a "Godzilla El Nino." The paper on the flooding, to be published in the Geophysical Research Letters, a publication of the American Geophysical Union, concluded that warmer conditions in oceans strengthened the winds that move moisture from the Gulf of Mexico to the southern Great Plains, causing more rain to fall on the region. At the same time, the study by Utah State's Shih-Yu Simon Wang and Robert Gillies as well as Wan-Ru Huang of the National Taiwan Normal University, found that storms are tracking farther south and form west of Texas during El Nino years, sending heavy rains over the southern plains. "There have been studies showing that warming induced more moisture from Gulf of Mexico. That is your moisture," Wang told CBS News. "What can pump the moisture into the air? You have to lift it up to form the clouds. This is more related to strength and position of the jet stream. That is where El Nino comes in." After a prolonged drought blamed in part on La Nina, a cooling pattern in the Pacific Ocean, Texas and Oklahoma were hit in May with record rainfall that brought flash floods and forced thousands to flee their homes. According to the AGU paper, Texas got enough rain in May to cover the state in eight inches of water, and Houston suffered $45 million in flood damage. Typically, the jet stream would move storms from west to east across the U.S. In May, it funneled storm after storm to Texas and Oklahoma, while the Northeast was unseasonably dry, California remained stuck in drought, and Alaska had its first 90-plus degree day earlier than ever. Despite the unusual flooding, the authors were careful to say that no one storm could be definitively linked to climate change. Their caution is similar to that seen with tropical storms, where a debate has emerged over whether warming seas are causing more powerful typhoons and hurricanes. They noted, for example, that April and May are traditionally some of the wettest months of the year for Texas. And with rains in April, the soil was already soaked and vulnerable to flooding when the storms hit in May. Still, they emphasized the floods wouldn't have been so bad without climate change. "Everything has to work the way it did to make an extreme event. But without warming, the floods in May wouldn't be so extreme," Wang said. "On the one hand, you have many players on the team but there is always an important player that can make the difference." David A. Robinson, the New Jersey State Climatologist and a professor at Rutgers University who did not take part on the study, said he found the findings of the AGU paper "plausible." "To me, it emphasizes the fact that at present and for decades to come we must factor in some underlying influence of our changing climate - the baseline climate if you will - to any sort of meteorological or climatological events," Robinson said in an email interview. "That might include flooding rains, a heat wave or a drought. This does not mean to suggest that these extreme events are caused solely by climate change - and I'm speaking of human-induced change," he said. "Rather, that when an extreme event occurs one must factor in some role/influence that the underlying changes are exerting on things. For instance, making a wet spell somewhat wetter, a heat wave longer and more extreme, a drought more extreme and covering a larger geographic area." Nielson-Gammon agreed, saying the methods "seemed sound" and dovetails with the science, which calls for "increased rainfall in the tropics due to a warmer climate, and thus enhanced rainfall variations during an El Nino." Though the paper doesn't calculate how much El Nino and climate change would have impacted the rainfall in Texas and Oklahoma, Nelson-Gammon estimated it would have made a small but significant difference. "The size of the estimated impact is about 0.5 inches. In the context of 9 inches of rain in Texas and 14 inches of rain in Oklahoma, it's only an extra 5 percent or so, but that does change the odds of such an extreme event quite a bit," he said. "I estimate it doubles the chances of getting something as extreme as what happened."